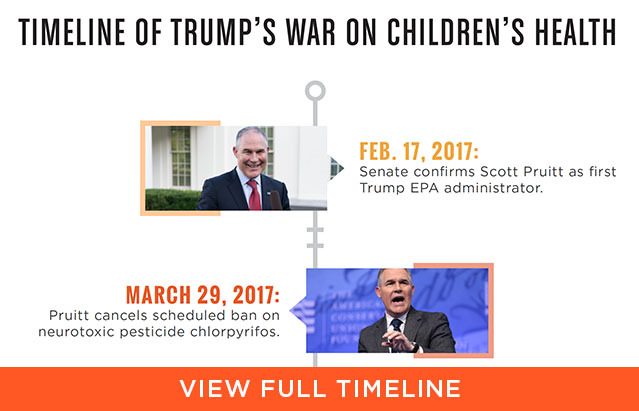 One of the first decisions of the Trump EPA was former chief Scott Pruitt’s scuttling of a scheduled ban of the highly toxic pesticide chlorpyrifos. The agency’s own scientists said it was dangerous to children even at very low levels. Exposure to chlorpyrifos disrupts the brain’s nervous system, causing tremors and diminished IQ levels in children. The chemical agriculture and pesticide industries hailed the decision, but public health advocates, including the American Academy of Pediatrics, pleaded with the EPA to enact the ban as scheduled. On Aug. 10, a federal appeals court ruled that Pruitt’s decision violated federal law and ordered the EPA to ban chlorpyrifos within 60 days. But Wheeler and Trump are fighting back. The EPA has refused to obey the court’s order. On Sept. 25, the Justice Department filed a petition on behalf of the agency, calling on the court to overturn its earlier ruling and leave chlorpyrifos legal. On Sept. 30, The New York Times and The Washington Post detailed Wheeler’s scheme to repeal an Obama-era rule that has cut emissions of mercury and other heavy metals, such as lead and arsenic from coal-fired power plants, by 70 percent. Mercury is a potent neurotoxin known to harm the nervous systems of children and fetuses. Mercury in the air settles in the ocean, where it is ingested by tuna and other fish. When people eat the fish, they also ingest mercury, which can be passed from mother to fetus in the womb. On Aug. 21, Wheeler released the Trump administration’s replacement for the Obama administration’s Clean Power Plan, which sought to significantly reduce dangerous, ozone-depleting pollution from power and petrochemical plants. In 2015, the Obama EPA estimated that the Clean Power Plan could prevent between 1,500 to 3,600 premature deaths annually and 140,000 to 150,000 asthma attacks in children. Trump’s EPA later increased the estimated number of preventable premature deaths to 4,500 a year. The proposed repeal would mean 36,000 premature deaths and more than 600,000 cases of childhood respiratory disease each decade, according to Harvard University experts on the human impact of public health policies. On Sept. 25, Wheeler abruptly and with no apparent reason placed the EPA’s top children’s health official on administrative leave. Dr. Ruth Etzel was made to hand in her badge, key and cellphone, and sent home. A leader in children’s environmental health for 30 years, Etzel had been tapped in 2015 by President Obama to run the Office of Children’s Health Protection, whose stated goal is to “ensure that all EPA actions and programs address the unique vulnerabilities of children.” Her dismissal came amid rumors that the office she headed will be closed. Sidelining Etzel is “the opening gambit in a plan by this administration to dismantle EPA’s Office of Children’s Health Protection,” said Dr. Philip J. Landrigan, one of the nation’s leading pediatric experts and the dean of global health and director of the Children’s Environmental Health Center at the Icahn School of Medicine at Mount Sinai. On June 20, the Agency for Toxic Substances and Disease Registry, or ATSDR, released a study concluding that the “minimal risk level” for exposure to toxic fluorinated chemicals, known as PFAS, should be up to 10 times lower than the level recommended by the EPA. Studies have linked the two most notorious PFAS chemicals, PFOA and PFOS, to reduced effectiveness of childhood vaccines, developmental defects and other serious health problems, including cancer. EWG estimates that PFAS chemicals may contaminate the drinking water of more than 100 million Americans. The White House and the Pruitt EPA sought to block release of the ATSDR study, fearing a “public relations nightmare.” Since its release, a number of states have acted to set much lower legal limits or health advisories for PFOA, PFOS and some other PFAS chemicals. But under Wheeler, the EPA has stuck with its previously recommended level for PFOA and PFOS, which is not legally enforceable, and has issued no health guidance on other PFAS chemicals. Wheeler’s actions came as no surprise. Before he was tapped to replace Scott Pruitt, who was forced to resign in disgrace, Wheeler was a top lobbyist for the coal industry. One of his clients was coal giant Murray Energy, which paid Wheeler and his firm more than $3 million to represent the company in Washington. Before his time as an advocate for the fossil fuel industry, Wheeler was a longtime top aide to Sen. James Inhofe, R-Okla., the leading climate change denier in Congress.